about that new Saw Vice, as seen at WIA . . . I'm curious if any of you happened to have taken a look at the new saw vise with its cam locking device from the "Tools for Working Wood" over at WIA. in order to apply/form a decorative edge to either of them. p.s. other alternate uses . . .
Last edited by RogerSavatteri; 10-15-2009 at 11:47 AM. Re: about that new Saw Vice, as seen at WIA . . . I was very impressed with the saw vice. Tim and Joel designed it but I think it was primarily Tim's work. Unless he has a lot of metal stamping experience he must have had some help from the fabricator because it is a very sophisticated use of stamped sheet metal. Cold rolled from appearance but it could be hot rolled that's been blasted later. I think it is very handsome in it's material transparency and brilliant in technical design. It's just some sheets of steel punched, stamped, and riveted and it fairly efficiently transfers a twisting force to a pinching force 8 inches away. 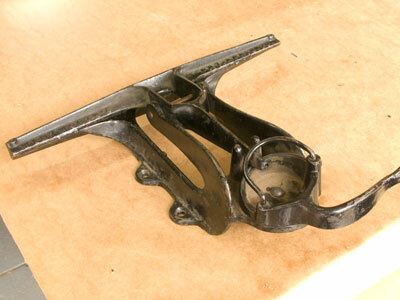 Traditional saw clamps are made of several pieces of cast iron. And it works, although I didn't actually test it's chatter resistance. I'd assume that was one of the prime criteria and if it didn't pass they wouldn't have shown it. It could work as a break for thin sheet metal and a clamp for veneer. It's 14" capacity is greater than other saw clamps at least in the width of the jaws. It's about 2 inches wider than my old cast iron clamp. I read Joel's blog, "It's made out of very thick, ordinary, mild steel." They got the design from an old Wentworth vise, the important features being that the vise is bolted high up to a bench so there isn't much cantilevered length from the anchor to the jaws. The camming twist clamp feature is also derived from the Wentworth. Last edited by MichaelKellough; 10-15-2009 at 03:28 PM. I helped Joel and Tim out in their booth at the show, and spent a lot of time with the vise. It is easily the best saw vise I've ever used. And yes - Tim is a whip-sharp designer. In terms of the other uses Roger was asking about, I think it would work very well for most of those applications with one serious caveat - the maximum opening of the vise is relatively narrow; I don't know exactly how wide it was, but I'd guess something on the order of 1/8 - 3/16". So as long as you're working with relatively thin sheet metals. As for veneer work, I'm not sure it would be the best tool for that as it would be really hard to fit a sub-jaw to it, and I'm not sure the jaws as-is wouldn't do some damage to veneer. I think you might be able to work veneer as long as it was sandwiched with some thin barrier material, but I can think of other ways I'd prefer to work veneer. The camming arrangement at the bottom is interesting. How smoothly does that lever work? Is the pivot just a slightly loose rivet, or something more elaborate? I'm also curious about how the cam surface is created. It'd have to be fairly smooth. Does it appear to be machined? The sheet metal vise as a successor to a cast iron design reminds me of pistol and submachine gun designs that replaced machined-from-solid components with artfully stamped metal when, uh, pressures on the manufacturers* forced them to find alternate solutions. * The pressures were usually bombs dropped on the factory. I think the pivot is just a rivet. The motion is a little stiff but should get easier when the square edges soften. "For fine adjustment of clamping pressure you might want to ease the edges of the spiral groove the pivot arm bears against and maybe add a little grease. I don't think that would cause the clamp to loosen unexpectedly but..."
Am I the only one that looks at that and thinks "really big jointmaker pro" ?? You beat me to that answer. I'm not a psychologist, but I believe you're experiencing withdrawal anxiety, which leads to delusions - after having sold your JMP. You shipped it out last week, didn't you. ?